This graph presents an overview of the architecture of all binary systems harboring a confirmed exoplanet on an S-type orbit, that is, a planet orbiting one of the two stars in the system. This list is exhaustive for all binaries of separation <200 AU (fig. 1) updated on 11/07/2018. Figure 1: All systems with at least one confirmed exoplanet and one confirmed stellar companion with projected separation <200au. Figure from Thebault & Haghighipour (2015), updated on 11/07/2018. N.B. : The graphs might be freely re-used, as long as properly credited to Philippe Thebault and referring to the original Thebault & Haghighipour (2015) article. The blue circles' location shows the semi-major axis of the exoplanet while the yellow circles show the location of the companion star. The radius of the blue circle is proportional to the estimated radius of the planet (or the cubic root of its mass when only a mass estimate is available). The radius of the yellow circle is proportional to the cubic root of the mass ratio between the companion and the central star (for the sake of visibility, the sizes of the planets have been inflated by a factor 20 with respect to the sizes of the yellow stars). The black vertical line plotted between the planet and the stellar companion represents the outer limit for long-term orbital stability as estimated with the widely used empirical formula of Holman & Wiegert (1999), assuming that the planet and the binary are coplanar. For systems where only the projected separation of the binary is known, the stability limit is computed assuming that the companion star is on a circular orbit whose radius is equal to the projected separation. 2) Systems where the third star is very distant from the central binary, typically more than 10 times the distance of the closer companion star. In this case, the gravitational pull of the third star is ignored when estimating the planet's stability. We chose a rather conservative policy of excluding all systems with « planetary » objects having a mass (or a minimum mass) higher than 13 MJup. However, we display the > 13 MJup companions for the few systems (2 so far) for which an exoplanet has been detected in addition to them. These >13 MJup objects are drawn in orange instead of blue. As already pointed out, for the vast majority of systems where only the projected separation between the stars is known while the actual orbit of the binary remains unconstrained, we consider the fiducial configuration of a binary having a circular orbit equal to the projected separation. The estimated stability limit thus only gives a first-order estimate and should be taken with caution. However, it can be reasonably considered as a rather conservative assumption with respect to the planet's orbital stability, as it corresponds to the smallest possible physical separation between the stars. Although it might be tempting to do so, it is difficult to straightforwardly derive statistics regarding the incidence of planets in binary systems, because the available list of systems is affected by several strong biases. The first one is that, until relatively recently, observational surveys, especially those relying on the radial velocity method, had been strongly biased against binaries, excluding known multiple systems from their potential targets. Another issue is that, for many cases, the binarity of the system was not known at the time of the exoplanet's discovery and was established by later observational campaigns. This means that there should still be a potentially large population of exoplanet hosting "single" stars that are in fact members of a (yet undetected) multiple system. To alleviate this problem, several large-scale adaptive optics surveys are currently underway in order to assess the presence of stellar companions around exoplanet hosts. 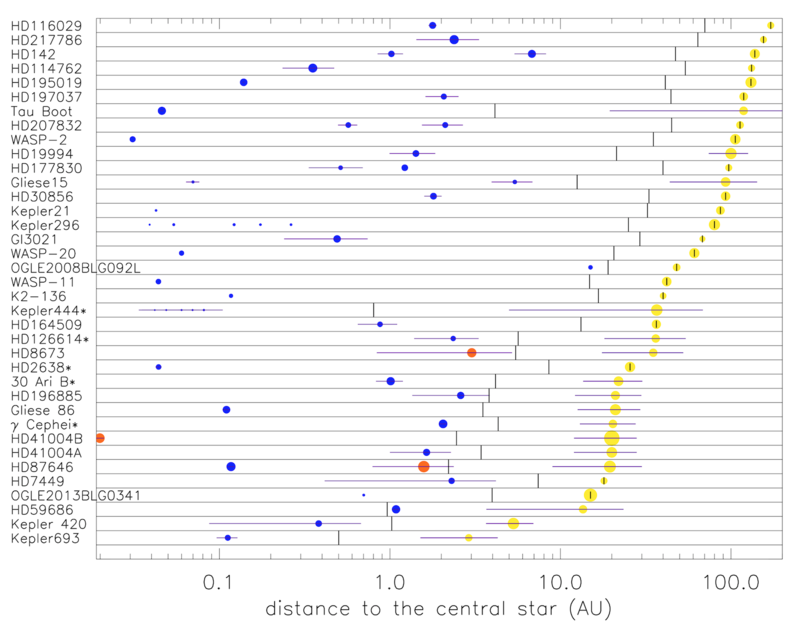 These surveys have already detected a large number of potential stellar companions (albeit mostly around yet-unconfirmed KOIs ("Kepler Object of Interest")), but the physical link between stellar components (as opposed to chance alignment with background stars) of each individual system remains yet to be established (see, for instance, Wang et al., 2015a,2015b, Kraus et al., 2016, or Ziegler et al., 2017). - Gamma Ceph A is a post-main-sequence star (sub-giant). Recent astrometry analysis (Benedict et al., 2018) shows that there is a 70 degrees mutual inclination between the binary and planetary orbits and that the planet probably has a much higher mass than previously expected (9 MJup). - Kepler 444: it is a triple star, so the data corresponds to the merged B+C M-stars (Dupuy et al., 2016). - HD30856, HD116029, HD207382, HD86081, HD43691, not listed as binary host by the exoplanet.eu and openexoplanetcatalogue.com sites. All objects described in Ngo et al.(2017). HD30856, 86051, 207382: companions presented for the first time in this paper. HD43691 & 116029: companions confirmed by Ngo. -TauBootis: refined investigation of the binary by Justesen&Albrecht(2019). Finds a larger semi-major axis than before (221au instead of 118, but with a large uncertainty). And constrains the periastron q to 28.3au+-3. Planetary and Binary orbits should be aligned.